Apple’s iTunes lets you create a local back of your iPhone/iPad to your Windows 10 PC. To make sure the backup is secure, you can choose to encrypt it and lock it with a password. Now it may so happen, that you may forget your password, and according to Apple, these passwords can never be recovered anyway. This is a huge problem. 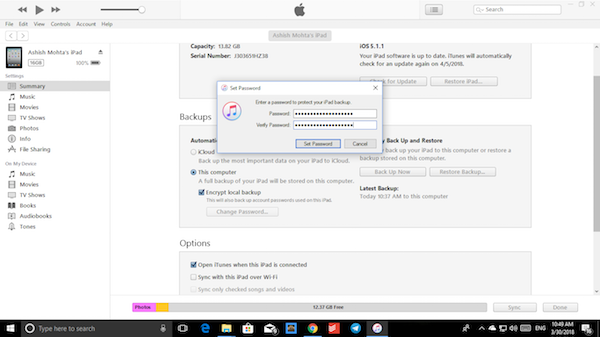 Though you can keep on taking backup and even sync your Apple device like you always do, you cannot restore it from if you have forgotten the password. You should know that even if you switch to a different computer, the password is still asked. It seems Apple saves these password into the device making it even tougher to crack. This is where iTunesKey software comes into play. It can recover the password for you without modifying the backup files or damaging them. However, it will take a lot of time to crack it, and if you have a powerful PC with a great graphics card, you can crack it even faster. It took hours for me to crack the password on my Windows PC which doesn’t have a graphics card. If you have a Graphics Card, you can adjust the GPU Timeout to optimize the process. The first thing you need to do is to locate the iTunes Backup file. Then navigate to Apple Computer > MobileSync > Backup. Here you will see a folder with a random name consisting of alphabets and number. 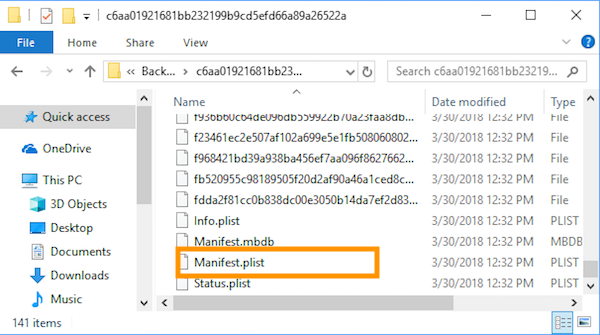 Open it and there should be a file named as Manifest.plist. 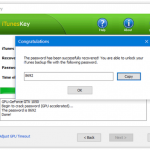 Download and install iTunesKey on your Windows PC. Launch it, and you will get an interface where it asked you to select iTunes Backup File. Choose the Manifest.plist from the above location. The next screen offers you three types of attack to reveal the password. I am sure you must be knowing a bit of the password, you may have to choose accordingly. For example, if you use Mass Attack, you can specify whatever you remember, and also provide what other characters that need to be checked. Similarly, if you have used a dictionary word to protect your backup, use the third option. If you select Dictionary attack, you need to specify a good dictionary for a successful recovery. Generally, Dictionary attack succeed because many people have a tendency to choose passwords which are short, single words in a dictionary, or easily-predicted variations on words. You can use either default dictionary or your own ones. 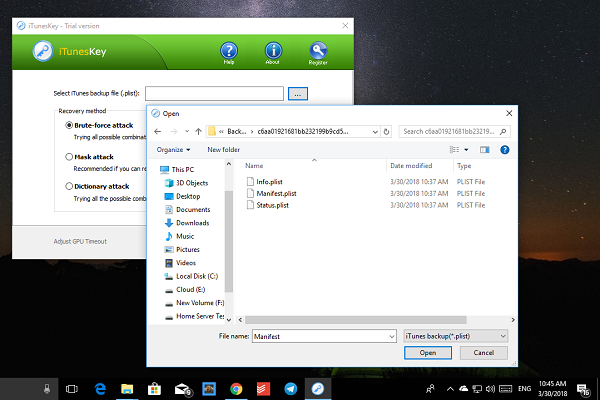 However, the Brute attack will take a lot of time because it tries every possible combination, and you really need a powerful PC to get this done. According to the developer, it attempts all possible combinations of passwords until the correct password is found. 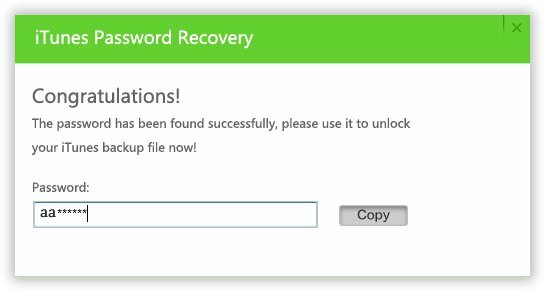 The password recovery engine is highly optimized, thus short password can be recovered immediately. Once done, it will reveal the password to you. Supports all versions of iTunes including iTunes 12. Support iTunes backup for iPhone 7 / 7 Plus, iPhone 6 / 6S, iPhone 6 Plus / 6S Plus, iPhone 5s, iPhone 5, iPhone 5c, iPhone 4s / 4, iPhone 3GS / 3G, iPod, iPad. That said, iTunesKey doesn’t come free. The software will cost you USD 20, but its worth if you want to keep restoring your Apple device from a backup. To know if this works, you can download the trial of the software which can Recover only passwords that are less than 4 characters in length. So you can set 4 character password which you don’t forget, and see if it can crack open it. If you’re locked out of your iTunes backup then you can’t access and view any content inside it, and Don’t expect to Apple because Apple doesn’t provide a way to recover or reset iTunes backup password. 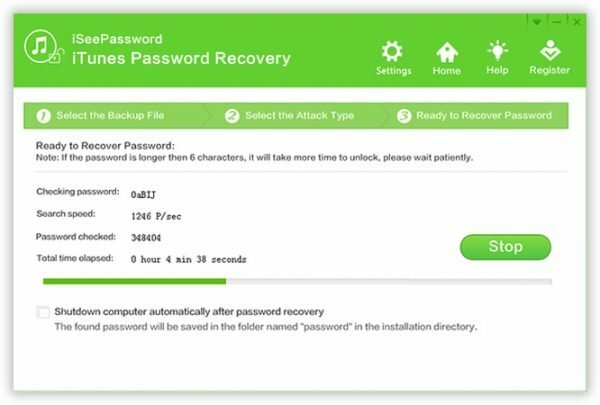 But iSeePassword iTunes backup password recovery software can be able to recover your lost backup password without touching original content in it. With the unique decipherment algorithm, it can automatically detect your encrypted backup files and quickly analyze the backup encryption process and find out the correct password with high accuracy. 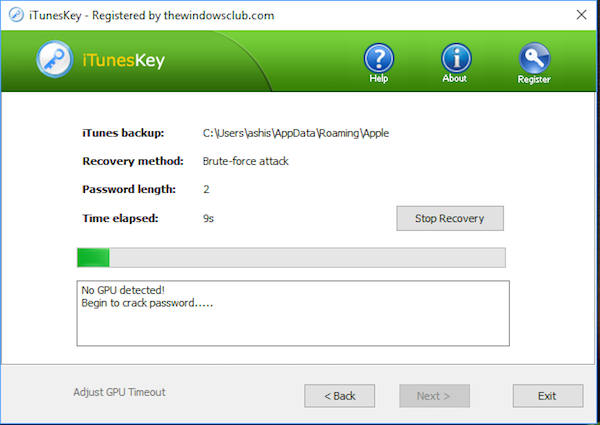 It provides three in-built attacks including force-attack, Mask attack, and dictionary attack, makes it more flexible to crack your iTunes backup password with easy. Step 1. After installing the program (Windows or Mac) on your computer, launch it and you will see the main interface like below. If you didn’t change the default backup catalog, then it will be able to automatically find iTunes backup file on PC. Just select the backup you want to crack. Step 2. after you selected the backup files then click the Next button. You will see there are two attacks: namely Brute-force with Mask Attack and Brute-force Attack. 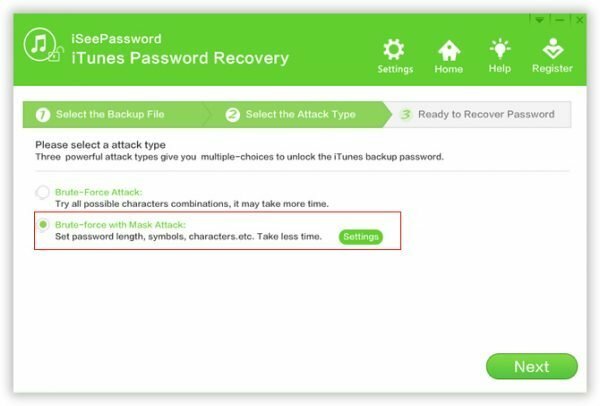 Select the most appropriate one to effectively retrieve the iTunes backup file password. Step 3. 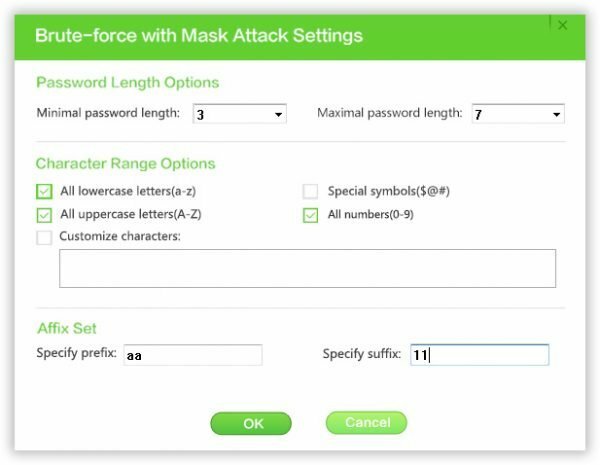 If you can remember any part of password info like the length of the password, range, then you can choose Brute-force with Mask Attack. Set these items can help you find lost password more quickly. 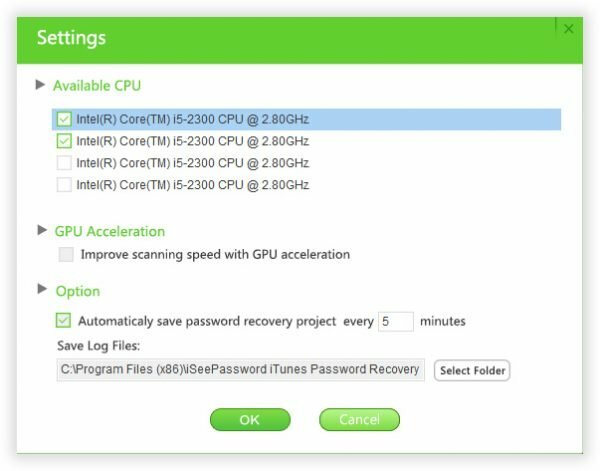 You can click Settings button to set the CPU and GPU, you’re allowed to specify how many CPUs working for password recovery. GPU could increase the speed up to 30 times than before. Step 4. When all settings are done, click Start button to begin the process. During the decryption process, you can simply click Pause or Resume button if you have an emergency to deal with. When you are back, you can continue the decryption. Step 5. 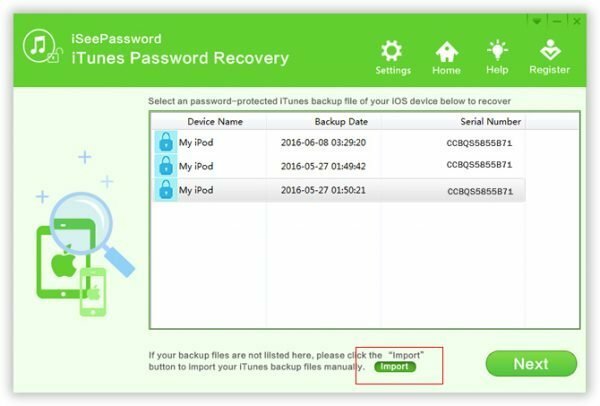 It will take some time to recover your lost iTunes backup password, it depends on password length, complexity and attack settings. The longer your password is, the more time it takes. So, try to provides more password info to program and it will take less time. Once it is found, you’ll see a pop-up window displaying your iTunes backup password. 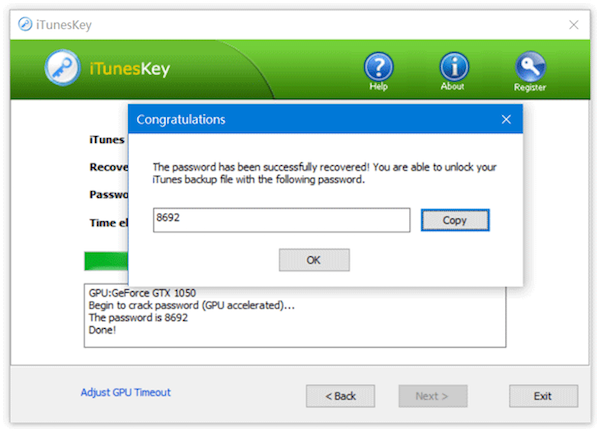 You can download iSeePassword iTunes backup password recovery tool.